Add some variety in the chests of Minecraft is concerned. 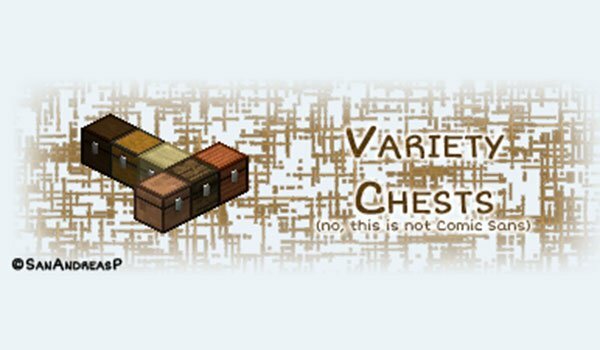 Variety Chests 1.7.10 is a mod that lets you create new designs for our chests, using for this diverse materials in the manufacturing process that will result in a new distinct chests chests Minecraft classic look. That is, if we use wood from trees of the jungle to a chest, color and texture of the chest will be different than usual. It’s just aesthetic change, chests all have the same capacity as before. Also in the crafting table, if at the time of making the crafting we add Glowstone in the center of crafting, that chest glow in the dark. We can only join two boxes of the same color or design. How to install Variety Chests Mod for Minecraft 1.7.10? Chests with different designs according to the wood on which they are made.